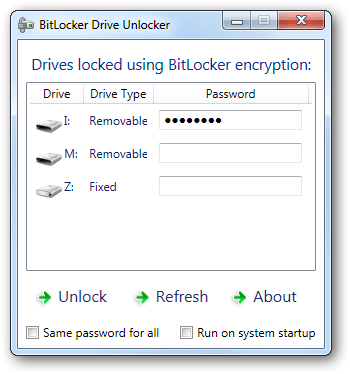 BitLocker Drives Unlocker is a free portable tool for Windows that allows you to unlock the drives which are locked using BitLocker Drive Encryption quickly. When you have more than one local drive locked using BitLocker, it becomes very irritating to unlock each of them manually. Run the tool and it will list all the drives that are currently locked using BitLocker. Enter the password for the drives that you want to unlock and click Unlock. If you have a common password for all the drives, then you can check the Same password for all option and it will automatically fill all the password fields with the first password field. To automatically run it when Windows starts, check the Run on system startup option.